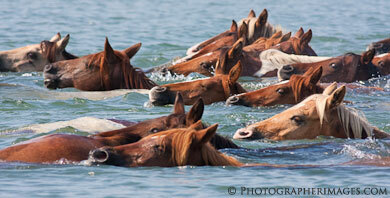 The Chincoteague Pony Swim is best seen via the Assateague Explorer tour boat. Get your best view of the special Pony Swim event on Assateague Explorer's tour boat that is equipped with a restroom and plenty of shade. The tour boat is the best way to get a close view of the swim, unless you want to wait with approx. 40,000 visitors for long hours along the shoreline in the sun, at an area much further from the swim. There are no restrooms near the swim since it is a tidal marsh. The special Pony Swim boat excursion is a once-a-year opportunity for you to see the Chincoteague Annual Pony Swim held in July. The Annual Pony Swim & Auction will be held on the last consective Wednesday & Thursday (swim on Wed & auction on Thurs). See approx. 150 Assateague Ponies (including foals) swim across the Assateague channel from Assateague Island to Chincoteague Island. Seats on the boat are limited for the special Pony Swim event. This boat is like getting a ticket to the Super Bowl on the players bench at the 50 yard line. This is a once a year event. Be sure to email in advance to reserve your seats. Seats are always sold out each year. Email now for reservations. While you are visiting, be sure to get a great view of the Pony Swim and relax in comfort. Make this once-in-a-lifetime event a worry free experience. Due to the limited seating & the high demand, an advanced reservation is a must. Planning a visit to Chincoteague & Assateague? Keep in mind - Assateague Explorer's daily Pony Express Tour. The cruise offers you the best way to see and experience the wild ponies of Assateague Island in their natural environment. The native captain & crew know where to travel to see many herds along the island each day. You can see many wild ponies (about 300 live on Assateague Island). Various herds of ponies and their foals live in remote areas and the daily pony express cruise gets you there. The boat tour visits the most outstanding areas along Assateague Island where different herds of wild ponies are seen everyday. You can see bald eagles, dolphins, birds and other wildlife along the way. Take a look at some of the tour photos . The daily cruise operates April - Oct from Chincoteague Island, Virginia. See the Pony Swim up close and in comfort!!! Held on slack tide between 7 am - 1 pm. Kayak Tour to see the swim is also available. Daily Cruise & Kayak Tours: April-Oct.